Welcome to Moscow and Beyond, a blog for participants in the Spring 2009 Russian Seminar in Moscow. Buddhism arrived in eastern Buryatia early in the 17th century. By the early 20th century it had consolidated influence to the extent that Buddhism was recognized as a state religion in Russia and a Buryat monk was given permission to build a Buddhist datsan (monastery) in the capital St. Petersburg. However, nearly a decade into Soviet control of Buryatia, Buddhism’s influence was radically scaled back. Alongside collectivization, datsans (monasteries) were closed and lamas’ rights revoked. By the late 1930’s almost all lamas had been imprisoned or shot and all datsans closed or destroyed. It was during this period that the Aninskiy Datsan, which we visited in Buryatia, was demolished by Soviet tanks. Following World War II Stalin partially reinstated Buddhism in Buryatia, just as the Russian Orthodox Church was rehabilitated during World War II to unite Russians against Nazism. In 1946 permission was given for the Ivolginsky Datsan to be built 30 km outside of Ulan-Ude, the capital of Buryatia. For the next 45 years this datsan would serve as Buryatia’s only center for Buddhism. The monastery was prominently advertised by Soviet authorities to the West as an example of their religious tolerance, but in reality Buryats in the Communist Party and with positions of power were essentially forbidden from worshiping there at the risk of losing their jobs. Furthermore, beyond the scope of the Ivolginsky Datsan Buddhist activity was strictly forbidden. As such, despite official party line, Soviet power made significant efforts to choke off Buddhism’s prominence. During our visit to the Ivolginsky Datsan our Buryat guide Rada told us that Communist Party members often disguised themselves when they visited Ivolginsk. Even then they ran the risk of being identified by the KGB agent who reportedly wrote down the license plate numbers of each vehicle that visited the datsan in order to identify miscreant Soviet citizens. Our guide Rada also told us another interesting anecdote, this time related to the more modern history of the Ivolginsky Datsan. According to her: in the 1920’s, the head lama at the datsan foretold the rough times ahead for Buddhism under Soviet rule and asked his students to chant funeral prayers for him as though he were already dead. When they refused, he chanted the first prayer, after which they also began chanting. The lama was sitting in a lotus position and his students soon noticed that he was dead. He had told them to bury him in this position and not to remove his body “until it would be possible.” Ultimately this meant waiting until the early 90’s. When his body was removed, it was found to be just as when buried: the skin still sweats, the body is soft to the touch, and the lama’s hands are held up in the air. Seven times a year the body is displayed and the Ivolginsky Datsan is packed with visitors who have prayers to offer. It is said that the body is heavier when carried back after each service, as if it carries with it the weight of the crowd’s prayers. 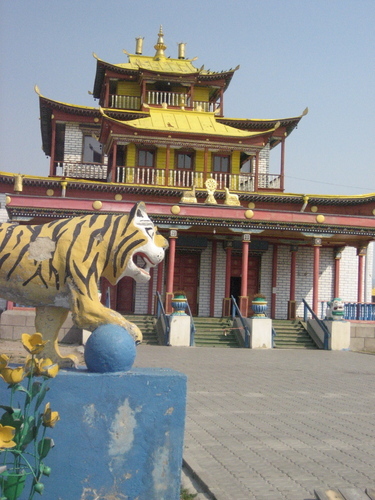 As we saw, the Ivolginsky Datsan was a monument to many Buddhist customs. One that was particularly interesting was the prayer wheel. Throughout the area of the datsan were cylindrical wheels with the character “Om” inscribed on them. This “Om” symbol represents the belief in the three jewels of the lotus (the Buddha, the Dharma and the Sangha). We passed through many prayer wheels, taking care each time to spin them clockwise. Some of us left money to honor these sacred places. The prayer wheels are so important because each time they are spun, a prayer is said to be sent into the world. The more prayers that are sent, the more good karma is put into the world on behalf of others. These well wishes also contribute beneficially to those who originate them. 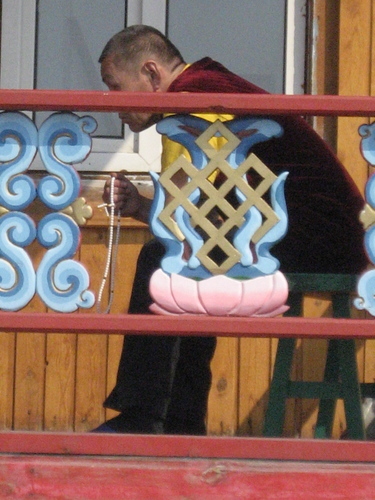 The concept of the prayer wheel is even incorporated into Buddhist services. A small staff-like instrument contains a miniature cylindrical wheel that can be spun around simply by the movement of turning your wrist. Our trip to Siberia showed us just how much territory Russia spans. Not only did we see a great deal of land, however, but we also encountered significant differences in culture and religion. Before our trip to Buryatia, the only religion that came to mind when thinking of Russian faith was Russian Orthodoxy, but now, Buddhism is just as much at the forefront. Just as the Russian Orthodox Church is so closely tied to Russian history, Buddhism is inseparable from the history of Siberia, especially Buryatia. The story of Ivolginsky Datsan is a perfect example. It’s actually surprising that Stalin’s power reached as far as the inner steppe of Siberia, but this speaks to the colossal damage he enacted upon the entirety of Russia. Just as the lama’s body at the Ivolginsky Datsan has stayed intact, so have the hearts of Buryat survived Russia’s tumultuous history. The prayer wheels continue to be spun, and we can hope that greater good will come. I visited Ulan Ude and Ivolginsky in July 2009. The legend of Khambo Lama inspires visits to the Ivolginsky datsan by believers and tourists. The influence of Buddhism in eastern Siberia is a worthwhile case-study. Buddhism is a mark of Buryat identity. The intellectualism and activities of Buddhist scholar monks is a subject of interest in post-Soviet Buryatia.